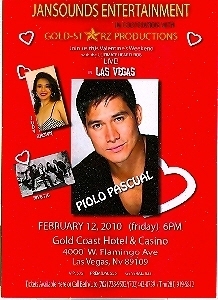 Promo card for Piolo Pascual, Filipino film and television actor, model. This event took place at the Orleans Hotel Casino, Las Vegas, Nevada, on February 12, 2010. Card is 3 1/2 X 5 inches, in mint condition. Buyer is responsible for 0.75 postage within Beautiful USA and Canada. Please email if you need additional details on the card. Thank you for checking us out!